The gamblers sing "Luck Be a Lady Tonight" in a scene from the Beef and Boards production of "Guys and Dolls." My parents have been gone now for several years, but it never ceases to amaze me what can bring them right back to top of the mind for me. Of course, it's April 20 and that always makes me think of Mom. April 20 was her birthday, which I always delighted in reminding her was also the birthday of one Adolf Hitler. You know, I'd remind her, that astrology stuff is pretty accurate. Birds of a feather and all that. That all ceased to be funny when the Oklahoma City bombing occurred and Columbine followed in quick order, both citing the perpetrators' acknowledgments of Hitler's birthday. Meanwhile, every time I watch or listen to a baseball game I think about my Dad and how much he wanted me to be the professional baseball player he never got the chance to be, thanks to World War II and a nasty Air Force plane crash in Texas. He did hit a foul ball off the legendary Satchel Paige, a story I heard early and often. My Dad was a lot of things, but one thing he wasn't was a musical theater aficionado. Disciplinarian, outdoorsman, perfectionist, sportsman, martinet, buddy. Yes, but definitely no theater-goer. 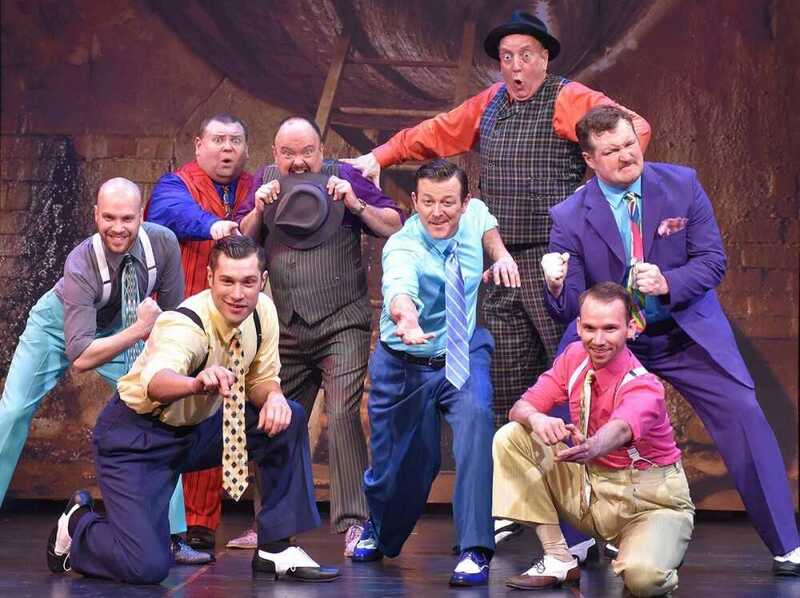 Yet he loved, loved, loved the musical "Guys and Dolls," and when I got a chance to see the five-time Tony Award-winning musical recently at Beef and Boards in Indianapolis, it brought me right back home. I'm sure most of the interest Dad had in the musical had to do with the horse racing and bookies storyline and the gambling connotations of the lyrics therein. Of course, my Mother hated that my Dad loved all that and got me hooked on going to the track summer evenings after work. Did quite nicely betting the last three or four races a couple times a week at Sportsman Park in Chicago until that night I came home with a pari-mutuel ticket stuck to the bottom of my shoe. Mom went ballistic. It seems when my parents were first married, Dad bet often and owed the bookies some money. Mom never forgave him. Kind of like Nathan Detroit (played by Eddie Curry ... no, not the former Chicago Bull) and the oldest continuous floating crap game east of The Alleghenies. Or Sky Masterson (Timothy Ford in the role) and "Luck Be a Lady Tonight." And Nicely-Nicely Johnson (played by Shaun Rice, loved him as Uncle Fester in "The Addams Family"). "I've got a horse right here, the name is Paul Revere ..."
That's the only show tune lyric I ever heard my father sing. The song is actually called "Fugue for Tinhorns." Paul Revere. I got the horse right here." Yay, funny how that just tugs at my heart. Musicals really aren't supposed to do that, are they? Never thought about how such a shared experience can evoke such personal memories. Thanks, Beef and Boards (and as always, you, Patricia Rettig). Kudos to the guys and of course, the dolls at the best dinner theater around for a marvelous incarnation of a classic musical. My Dad and I thank you. "Guys and Dolls" is on stage until May 15 at Beef and Boards. The box office can be contacted at 317-872-9664 or boxoffice@beefandboards.com.